They’re both the same except the one on the left is very hard and the one on the right is very soft. The one on the left works in an early Vanagon but you put it in backwards. And it’ll have to be made from the material on the left – the white one. 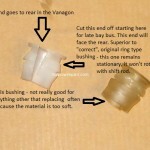 Since you can’t necessarily pick the bushing you want, you’ll just have to look around. I’m trying to acquire a bunch of them so if you really want one, let me know. This really works. 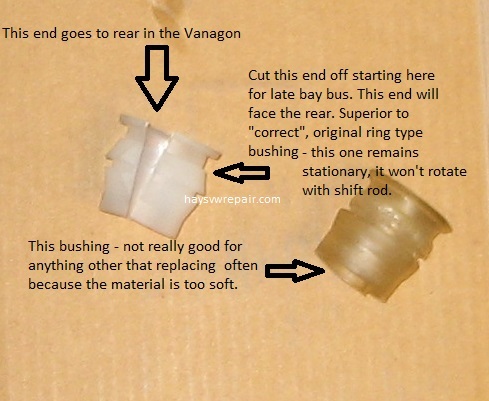 And the Vanagon bushing is not available at this time but this is a viable long term solution and may work better than the real thing – very snug fit. Use lot’s of grease. Tuning up the selector ball cage at the Vanagon trans rather than replacing the ball assembly is a viable fix for decreasing the throw at the shifter. Realize too, a new ball assembly may still require the cage to be “fixed up” for zero ball wiggle. What you do is squeeze the upper cage with pliers until when you insert the ball, there’s no play between ball and side of cage (side to side, I think – think about it when doing this). For the lower cage, use a ball peen again slamming at the contact point (where the ball touches cage in operation). The lower cage contact points are at the front and the rear of the cage. You’re trying to make the inside contact point convex, thus eliminating play. Squeezing with pliers won’t work on the lower cage. Realize any wiggle in the linkage translates to slop at the shift lever. Eliminating as described above will go a long way in doing so. The shifter assembly seldom gives trouble however there’s two bushings for it where the shift rod attaches. These bushings are easy to find. There’s a donate button on the home pages. Works perfectly, little effort required.